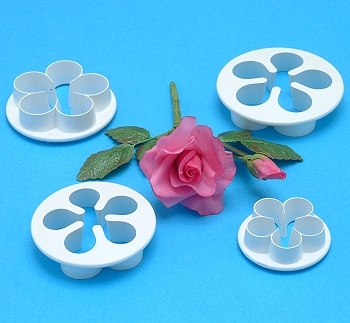 Create beautiful and authentic looking Roses with these specially designed cutters. 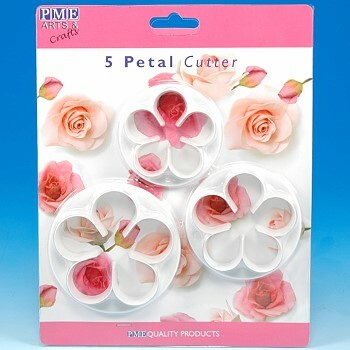 Five Petal Cutter Set allows the cake decorator to produce roses and other flowers simply and quickly. 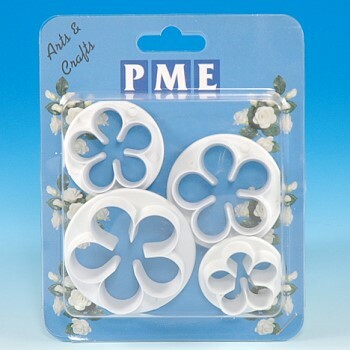 Made of plastic, height 1/2"
PME Sugar Craft England, producer of fine cake decorating tools. 1) Mold a basic cone and attach to floral wire. 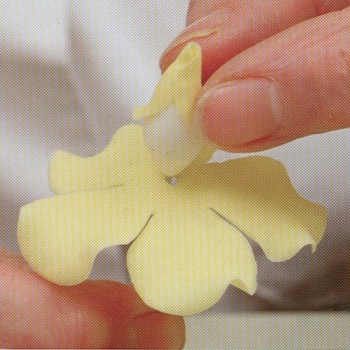 2) Roll-out gum paste and cutout 3 "Five Petal" shapes. 3) Place on a foam pad and soft the edges. 4) Attach the first layer of petals, by threading through the center. 5) Begin to attach to the center cone in an alternating petal sequence. 6) Brush on gum glue to assist in attaching petals. 7) Now attach the second layer and begin to overlapping each petal. Tuck each petal slightly inside the previous petal for a natural look. 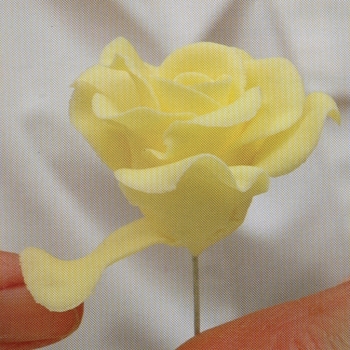 8) Attach the third layer, shaping each petal using your fingers for a delicate shaped bloom. 9) Attach a Calyx to the bottom to complete the rose.